xmp-wadsp.dll, the Winamp DSP plugin wrapper. xmplay.ini (the settings file), xmplay.library (the library file) and xmplay.pls (the current playlist file) are created when you start XMPlay. XMPlay is commonly put in C:\Program Files\XMPlay (or C:\Program Files (x86)\XMPlay on 64-bit systems), but that's not mandatory. If you'd like to run XMPlay from your portable drive, read more in XMPlay on a portable device. Most plugins can be found on the XMPlay page of Un4seen Developments and on this Support Site. Download the ZIP-files and add the DLL-files to the plugins directory. Note that XMPlay needs to be restarted to find new plugins. Configuration of the plugins is handled on the Plugins page of Options and stuff. 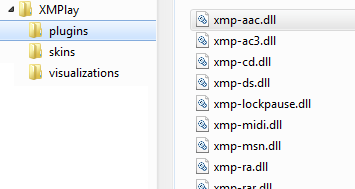 Note that xmp-wma uses the Windows Media Format modules which are installed with Windows Media Player (you can get them separately from the XMPlay page at Un4seen Developments). XMPlay also supports most Winamp input plugins. Some installers for Winamp plugins look for the Winamp executable specifically. A workaround is to create an empty text file in a folder, rename the file to winamp.exe and point the installer to the folder. Most skins can be found on XMPlay page of Un4seen Developments and all of them on this Support Site. Add the XMPSKIN-files to the skins directory. Note that XMPlay needs to be restarted to find the new skins. If you'd like to modify a skin, you can get most of the sources from this Support Site. For more information about skinning, refer to the Skinning tutorial. XMPlay uses Sonique visuals. You can find a nice collection at this Support Site. Add the SVP-files to the visualizations directory and restart XMPlay. Since Sonique development ceased to exist years ago, new visuals are created only sporadically. For those interested, the visuals API is available on the forum. Via xmp-wavis, XMPlay is also able to use Winamp visualizations in a separate window.